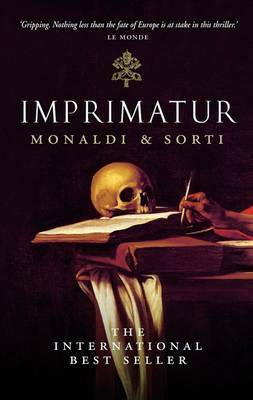 IMPRIMATUR by Italian academic couple Monaldi and Sorti is the first in a planned series of seven novels (three have already been published) focussing on the exploits of Abbot Atto Melani, castrato, cleric and master spy for King Louis XIV. This book has been published to great acclaim and over a million sales throughout Europe, despite struggling to find coverage and a second print run in its native Italy. The cool reception in Italy is alleged to be due to the Vatican annoyance at the book's criticism of 17th century Pope Innocent XI. The main body of the novel is presented as a modern day reworking by Monaldi and Sorti of a diary kept by an 18th century innkeeper's apprentice, which the Bishop of Como has sent to the Vatican Secretary in charge of sanctification. The Bishop has brought this account to the Vatican's attention due to the allegations it contains about the activities of Pope Innocent XI, whose case is being considered for canonisation by the Vatican. IMPRIMATUR is set in the Rome of the late 17th century, at a time of upheaval and uncertainty; the Turkish army are just outside Vienna, and the fate of Christian Europe is in the balance. Pope Innocent XI, renowned for his ascetic lifestyle, has rallied troops and raised money in support of the Austrians. Pope Innocent XI and King Louis XIV are at daggers drawn (this emnity is crucial to the plot). Atto Melani has been sent to Rome to investigate reports that Fouquet, disgraced former Superintendent of Finances, supposedly deceased on the prison island of Pinerol, has been seen alive there. As the book opens, in Rome in September 1683, there is a rather more immediate threat to the life and freedom of Atto Melani and his protege, an innkeeper's apprentice. The Bargello's men have come to forcibly board up the Donzello inn, where Melani is staying, due to a suspected plague death. The inn's inhabitants are ordered to remain in quarantine for the foreseeable future. These inhabitants are a rather motley crew, including an alcoholic innkeeper, a pompous doctor, French musicians, a beautiful courtesan in a tower, and a cowardly Jesuit, amongst others, some with shady pasts and assumed names that emerge during the course of the novel. Inside the inn, frightening rumours circulate that the the elderly Frenchman, Mourai, died of poisoning, not plague. When an English guest falls seriously ill with possible plague symptoms, the fear and claustrophobia are heightened. In addition to his assignment from Louis XIV, Atto Melani is determined to investigate Mourai's death, persuading the apprentice to assist. By night they navigate the underground passageways and rivers under the inn leading into various houses and yards of central Rome, encountering a grotesque pair of relic hunters who help them through the subterranean labyrinth. During their nightly travels, Atto and the apprentice uncover secrets about the plague and a plot that could tilt the balance in the Turkish attempt to invade Europe. After the end of this section of the novel, Monaldi and Sorti back up the historical element of the novel with copious historical notes and documents in support of the allegation that Pope Innocent XI bankrolled a protestant invasion of England. IMPRIMATUR is rather an unusual mix of pastiche crime novel and historical novel. The authors consciously draw upon the traditions of both classic crime fiction and The Decameron as Melani and his assistant investigate. Characterisation and plotting are surprisingly intricate, particularly with regard to the somewhat ambivalent nature of Melani, and the shifting opinions of the apprentice towards him as he learns more about his involvement with Louis XIV and Fouquet. At times though, IMPRIMATUR can be a challenging read, as the reader learns a great deal (in some instances possibly a little too much) about late 17th century food, medicine, music, politics, and even a sprinkling of astrology. A dry and at times slightly bawdy humour does however give the reader some respite from the courtly intrigues and politics. IMPRIMATUR is clearly an intelligent and complex historical thriller, bearing rather more of a resemblance to THE NAME OF THE ROSE than to THE DA VINCI CODE. I did however find it rather hard going at times, and suspect that it will be more to the taste of aficionados of historical fiction than to the average crime fiction fan.